TALKS • I am available to give illustrated talks on Walking Pictures, which can be tailored to suit, to local history or photography groups. As well as the talk we encourage people to bring along albums so we can identify seaside photos. Previous talk was at Boston Spa Village Hall in May 2018 for a private camera collectors club. Next talk is in Stockport in 2019, details to follow. Note to timewasters : I will not PAY to give talks (as Loughborough University expected, over £200!). I will NOT attend if my partner is expected to pay £25 for a ticket (as Great Yarmouth Council demanded!). EXHBITIONS • Easy On The Eye can arrange displays and exhibitions. We supplied material for a display at Worthing in 2016. I had a display of walking picture images running from April 16 – August 3rd 2011 at Sewerby Hall, near Bridlington, East Yorkshire. There is an online gallery of the images retained on this site (“Snaps” Walking Pictures ). The idea for this display arose after contacting East Riding of Yorkshire Council, and curators at Sewerby Hall and Gardens, who were helpful in furnishing me with information and images they held regarding the Snaps company and William Foster-Brigham, who operated in Bridlington. It is difficult to display original waking pictures. They were produced at speed and can become brittle with age and sensitive to light. For the exhibition I decided to produce a series of prints based on the original images but incorporating graphic and handwritten elements often found on the back of the photographs, placed there by the producers and subsequent owners. The original images were scanned at very high resolution then edited digitally, although nothing has been removed from the photographs themselves beyond some cropping. These new images were then uploaded to a local photographic processors via the internet and outputted onto Fujiflex, one of the new photographic papers developed in recent years for digital photographs. One cannot help but wonder what William Foster Brigham would have made of all these innovations in his trade. 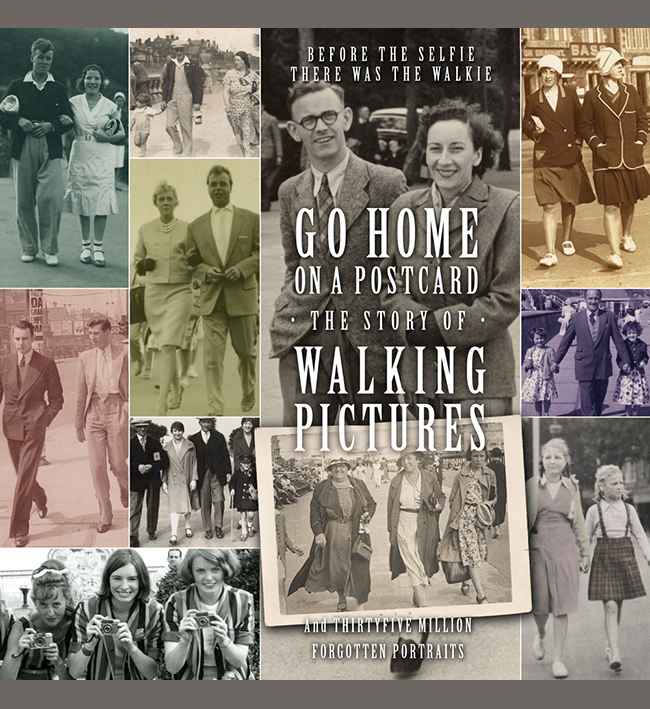 The original photographs are largely from the Easy On The Eye collection of Walking Pictures. In most cases the people are unknown but where we have any detail it is given in the caption list accompanying the gallery. I would like to thank Colin Harding at Bradford Media Museum for the loan of a couple of images. Also David Barnard who ran the remainder bookshop Wharf 18, Prince Street. David allowed me access to the premises to look for traces of the Snaps business before he closed his shop at the start of 2011. My thanks to our friends Alan and Diane for putting us up at their nice B&B close to the harbour at Bridlington (sadly they’ve now closed), and storing some of my Snaps shop finds in his shed before I could get them home! NOTE • The exhibition finished but the gallery didn’t bother to tell me. I only found out when my Aunt drove up to have a look and found it gone. I then had to drop everything and get over to collect all the material before the place shut for the season! Nice. 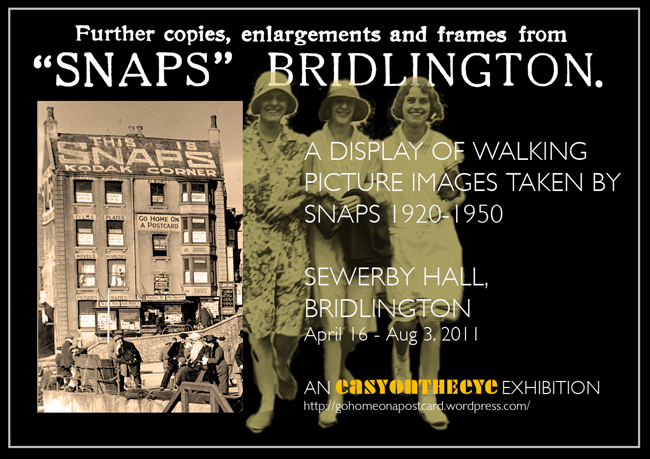 There is a history of “Snaps” Walking Pictures on this site, with links to the exhibition online gallery images. A book titled Going Home On A Postcard is in preparation for release in 2018. There is information about this on the site or you can contact the publisher’s website at Easy On The Eye Books for more information.